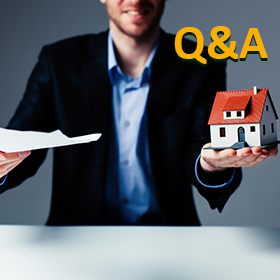 Q: Can you rollover your Traditional IRA to a Roth IRA and start buying real estate right away? A: Yes, the rollover from a Traditional IRA to a Roth IRA is called a Conversion. Conversions are taxable in the year the distribution from the IRA occurs. Q: What are the minimum funds required to set up a self-directed IRA? There is no minimum amount required to establish a self-directed IRA. Q: I have a $155,000 in a Traditional IRA. I am 58 years old and fall into a 15-20% tax bracket. Most likely I will not need my IRA for retirement and want to leave it to my children. Should I go ahead and rollover the funds to a Roth IRA and pay the taxes now? A: This is a tax and estate planning question best answered by an estate attorney or tax advisor. Q: If I have all my IRA funds in real estate, what happens to RMDs if there is no sufficient income through the real estate investment? A: You, as the tax payer, will owe a 50% penalty for any amounts not distributed. Q: I'm 65 and may retire next year. Is it worth rolling over an existing IRA to a self-directed IRA or a self-directed Roth IRA? What’s the difference? A: The difference between a Traditional IRA and a Roth IRA is the taxation upon distribution. Traditional IRAs have taxation upon distribution while the Roth will not have taxation on the earnings as long as you have had a Roth IRA for 5 years and is at least 59 ½. As far as would it be worth rolling the assets to such IRAs will be a good thing to discuss with your tax advisor. Q: Can I use back door Roth IRA to contribute to my Entrust account? A: If you mean contributing to a Traditional IRA then immediately converting it into a Roth, the answer is yes. Q: I have existing gold/silver. Can I send the physical metal to you to deposit into an account? A: Contributions can only be made in cash. The property cannot be contributed to an IRA. Q: I am looking to rollover a SEP IRA into a Roth IRA and pay the tax hit. Can I take the funds out before 5 years? A: Converted amounts can be distributed without taxation. If you are under 59 1/2 and distribute the converted amount, before a 5-year period is satisfied, you may be subject to a 10 percent penalty. Q: If I use a loan when purchasing a property with my IRA money, do I need to pay tax when I sell the property for the portion of loan ? A: Yes, the proportionate percentage of gains on the sale of a property under a non-recourse loan will be taxable. We encourage our readers to post any additional questions regarding Traditional or Roth IRAs in the comments section below so other readers may benefit from the answers. In addition, you can view the full recording to this webinar here to get answers to questions which are not listed in this article.